Lisa Cagnolatti is vice president of Customer Service Operations at Southern California Edison (SCE), responsible for operations that have direct, front-line communication with customers, including the billing and credit departments and the company’s customer contact centers. Previously, Cagnolatti served as vice president of the Business Customer Division at SCE. She oversaw the company’s relationships with its major industrial, commercial, and government customers and led cross-functional initiatives including outage communications improvement efforts, streetlight strategies, and efforts to stimulate business development. Cagnolatti joined SCE in 1996 and has held a variety of duties with the company in a broad range of management positions. She previously was the director of the company’s call center operations, director of SCE’s billing, payment, and credit activities, a region manager in SCE power delivery and construction organization, and the manager of SCE’s rural district organization, which encompasses approximately 39,000 miles of territory and serves 150,000 customers, some of whom also get water and gas from SCE. Before joining SCE, Cagnolatti worked 11 years with Southern California Gas Company in a variety of positions of increasing responsibility including account management, marketing, environmental policy, and regulatory affairs. She also worked for two years at Procter & Gamble as a paper manufacturing team manager. In addition to her professional responsibilities, Cagnolatti serves in a leadership capacity for numerous community organizations focused on improving educational opportunities for under-served youth and enhancing the lives of women and girls around the world. 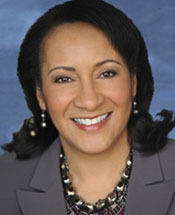 She is Board Chairwoman for the YWCA of Greater Los Angeles, a Board Member of the National College Resources Foundation, the International Black Women’s Public Policy Institute, and the American Association of Blacks in Energy. Cagnolatti earned a bachelor’s degree in chemical engineering from the University of California, Los Angeles, and a Master’s degree in Business Administration from Pepperdine University.